The neutral flavor of Sandalwood is perfect for meditation and healing. 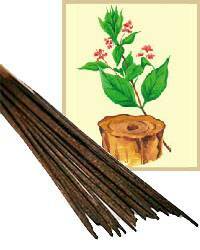 Sandalwood is often a favorite with men as they enjoy it's subtle fragrance. It is calming, balancing and harmonizing. Common Names: Sandalwood, White Sandalwood, White Saunders, Chandan, Sandanam. Part used to make incense: Heart wood oil. Description and History: "Sandalwood oil is one of the oldest known perfume materials with 4000 years of uninterrupted use. Sandalwood oil contains α-santalol and ?-santalol, alcohols that give the essential oil its soft, sweet fragrance. The human olfactory nerves are specific to the scent of the santalols. If the chirality (arrangement of the atoms in the molecule) of the santalols is changed to the molecule`s mirror image, the human nose cannot detect the fragrance". "Sandalwoods in India belong to the government, a tradition since 1792 when the Sultan of Mysore declared them royal trees. In early traditions, the white santals were uprooted and the trunks stripped of their limbs. The logs were left on the ground until ants had eaten away the light-colored sapwood." The Sandalwood tree is one of the highest yielding fragrant species of flora on earth. Being a parasite, Sandalwood tree is almost impossible to cultivate. 95% of all Sandalwood oil is classified as "Forest Produce" derived from Sandalwood trees at least 65 yrs old. All other aromatic oils are classified as "Horticultural / Agricultural Produce". Therefore, Sandalwood is considered as the rarest and the most precious of all aromatic oils. These trees are auctioned for trade by forest departments of the states of Karnataka, Tamilnadu and Kerala in South India. Due to its precious nature and rarity, a hefty black market thrives in Sandalwood oil and logs. In India, possessing even a small quantity of Sandalwood without proper documentation can lead to unpleasant consequences with authorities. Aromatic / Medicinal properties: Cardiotonic, Diuretic, Moisturiser, Astringent,Antiseptic, Antifungal, Antimicrobial, Coolant. Contemporary Applications: Perfumery, Ayurveda, Aromatherapy, Cosmetics, Incense. Making Sandalwood Incense: South India accounts for 90% of world Sandalwood oil production. The Sandalwood oil is sourced directly from the distilleries. After testing many brands of fine Sandalwood Incenses we shall modestly yet proudly claim that the Radha Madhava Sandalwood Supreme incense is among the very best in the world. Question: How many sticks are there in the packet?